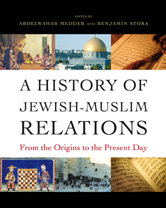 This is the first encyclopedic guide to the history of relations between Jews and Muslims around the world from the birth of Islam to today. Richly illustrated and beautifully produced, the book features more than 150 authoritative and accessible articles by an international team of leading experts in history, politics, literature, anthropology, and philosophy. Perceptions of the Holocaust in the Arab World: From Denial to Acknowledgment? Muslim Anti-Semitism: Old or New?